There aren’t many 11-year-olds from rural Montana whose destiny was mapped out in a magazine essay by a Pulitzer Prize–winning writer. John Heyneman has already spilled his life story when he mentions his mom’s friendship with novelist Wallace Stegner. It’s an afterthought, an amusing aside about how Heyneman’s mother, Susan, having read Stegner’s Angle of Repose, wrote him to say that the book helped her survive Montana’s harsh winters. The best honor she could think to bestow? Name a Red Angus bull on the family’s Montana ranch after him. 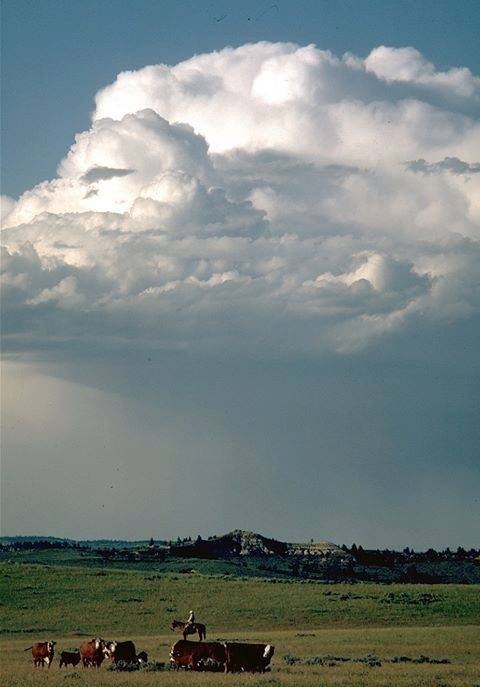 Susan and Stegner became friends, and he visited Big Sky Country to write about the Heyneman clan—Susan, husband Jack, “and their five feral children,” Heyneman jokes—for an essay about American West ranchers in Harper’s. It’s been 41 years since Heyneman ’89 saw his future in print. Susan got one of her predictions right: John flies small planes, but there’s been no summiting of Everest. Yet. And he’s on a ranch—Padlock in Sheridan, Wyoming, the 400,000-acre cattle operation started by his grandfather and Susan’s father, Homer Scott, in 1943. Now in his early 50s, Heyneman no longer spends his days building fences or roping calves. 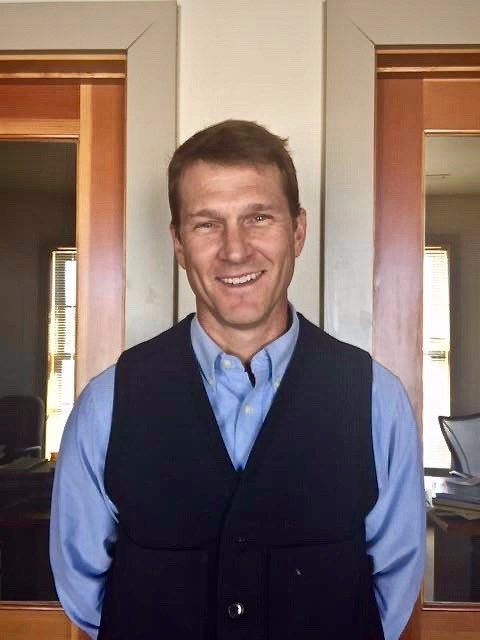 He has a full-time job as executive director of Plank Stewardship Initiative, an educational resource for high plains land managers and landowners. But get him talking about the long, laborious hours he spent at Padlock post-Carleton—when getting his hands dirty in the outdoors felt like the truest calling he could hope to hear—and the stoic, often measured Heyneman gets a Christmas-morning twinkle in his eye. The good ol’ days stretch back to Bench Ranch, a family-sized cattle operation at the base of the Rockies near Fishtail, Montana. With a trout stream in the front yard and the Beartooth Mountains extending straight up into the sky, Heyneman’s childhood home was “staggeringly beautiful, like a Sierra Club poster,” he says. “There’s so much I appreciate about where I’m from. Foremost, I learned responsibility by taking on tasks at the ranch and taking care of animals. I spent a lot of time on horseback. 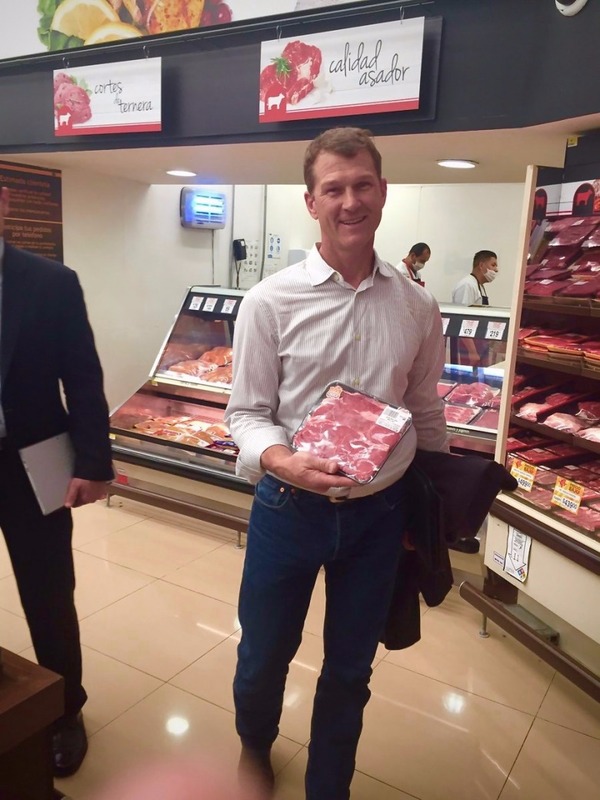 I’m a child of agriculture, and I loved it,” Heyneman says. John Heyneman and friend walking the Big Open during green-up. Heyneman says his path to Carleton was a “typical” one for rural kids: he was fascinated by what he didn’t know. His résumé consisted of fixing fences, irrigating hay crops, caring for chickens, and moving cows from pasture to pasture. The family didn’t travel much outside of Montana and Wyoming, so his parents encouraged him to abandon his comfort zone when he was looking at colleges. “My parents knew about Carleton and my mom specifically liked the Midwest. I think she was nervous I’d get out on the West Coast and become a surfer who was always six credits short,” he says. An American studies major at Carleton, Heyneman played football and basketball, and took some time to settle into his version of the liberal arts, which he eventually built around agricultural and environmental issues. Carleton also inspired him to experience more of the world. “I loved spending summers back at the ranch, loved being near the mountains, but I wanted to live abroad. There was more I needed to see,” Heyneman says. He spent the decade after graduation working throughout North and South America: two years in Brazil, a year in Venezuela, and several years in Mexico and South Texas. When he was nearing 30 and ready to settle down, Heyneman and his girlfriend—now his wife—Arin (also a Montana native), moved to Bozeman so he could pursue a master’s degree in soil science at Montana State. “It was time to go back home,” Heyneman says. Driving on little more than cow paths 15 miles off the main highway, Heyneman plays tour guide as his F-150 rumbles along the makeshift drag. He rattles off geographic points of interest like family history. The connection is deep. Heyneman and his two burly dogs get out of the truck and begin ambling up Benson’s Butte, a picturesque hill overlooking a large swath of lush green pasture with dozens of cows and calves grazing. Heyneman isn’t one for manufactured romanticism. He eschews the glorified “cowboy life” as displayed up and down Sheridan’s Main Street in everything from saddle shops and street murals to café marquees and neon bar signs. “Generations of kids have fled rural America because they don’t want to work the family ranch or farm. 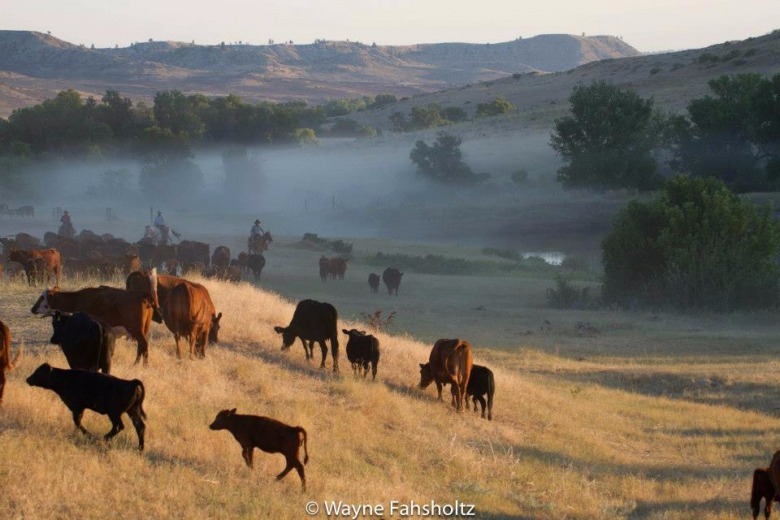 And sure, I wanted to see other things, too, but I always felt a connection to ranching, to the land itself,” Heyneman says. It wasn’t until he returned to Montana for graduate school that Heyneman’s full family history made its mark. In the 1940s, Homer Scott left Nebraska for Wyoming to work as an engineer for Kiewit Construction during the post–World War II boom. He was “part of the Microsoft of his day,” Heyneman says. Scott bought stock in the flourishing company, which went on to build much of the frontier West’s infrastructure and, in the process, built his own empire in Sheridan. He later expanded that empire into banking by purchasing the controlling assets of the Bank of Commerce in Sheridan—now the First Interstate Bank. Acquiring land was a particularly smart investment in the 1940s, and as Scott established himself as a pillar of Sheridan, the Padlock Ranch became an important fixture for cattle rearing in the region. The enterprise started with 300 cows and 3,000 acres in 1943. Today, some 10,000 head of cattle populate the sprawling property. The ranch produces 800-pound yearlings to be sold to finishing operations and then into domestic and international beef markets. 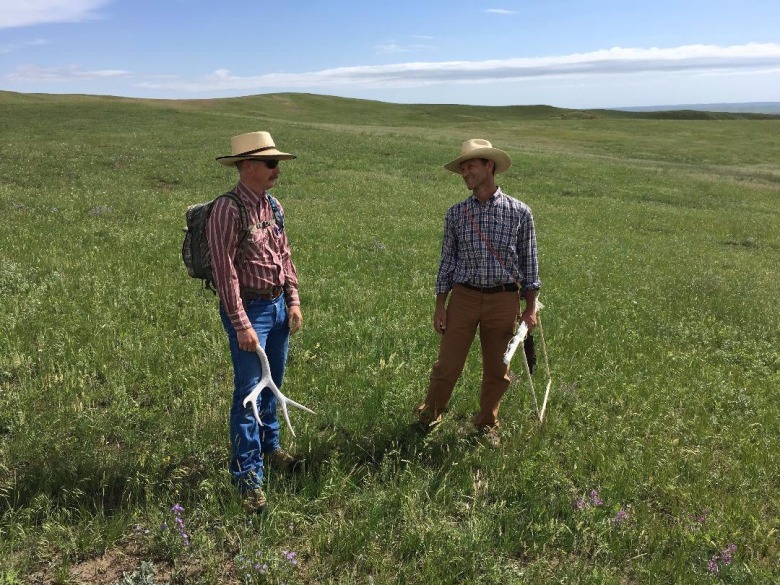 Land stewardship is important to the Heyneman and Scott families; a key tenet of Padlock Ranch management is to ensure adequate recovery time for grass plants after cattle graze. In support of its operation, the ranch also irrigates 5,000 acres of dry hay, corn silage, hay silage, and barley to augment Padlock’s feeding program and feedlot. Armed with a healthy dose of family ranching pride, Heyneman did everything at Padlock for much of his 30s. One day he could be out clearing weeds and moving cattle. The next, he’d be at headquarters devising ways to modernize the ranch’s human resources and asset management systems. Padlock is where the ranch Superkid became a ranch Superman. Often, after a hard day at the ranch, Heyneman would show up at his uncle Dan’s office around dinnertime, not quite ready to go home. Dan Scott, Homer’s oldest son, was a legend among Wyoming ranchers. He saw Padlock as a vocation. 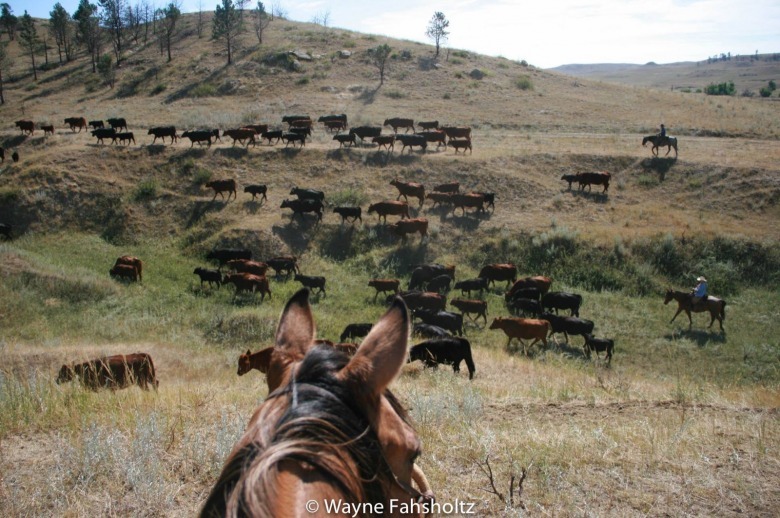 In Crow Country, Stegner examines the viability of next-generation stewardship. Jack and Susan were concerned that ranching wouldn’t be a sustainable industry for their children. “The life here is rich, strenuous, satisfying. Can that condition hold?” Stegner wrote in 1977. Heyneman serves as the connective tissue between past and present through his role as chair of Padlock’s board of directors. His ascension to the head of the table feels several decades in the making. Heyneman knows the land and business as well as, if not better than, anyone. He’s also somewhat of a third-generation bridge to Padlock’s future—whatever that may mean as the Scott family moves forward. But it’s also necessary. Last year marked Padlock’s 75th anniversary, a major milestone considering that a lot of family operations don’t make it to the third generation, Heyneman says. Will the ranch make it to 100? Will the land mean anything to generations four, five, and six? Does Padlock fit into anyone’s plans? One of Heyneman’s goals as family steward is to spark conversations about interest and responsibility—even if it’s just for recreational purposes—among future stakeholders, including his own children, Quinn, Aria, and Bae-John. A connection to the land can’t be forced, either. It may never come. Quinn, who is currently looking at attending college on one of the coasts, has the same wanderlust his old man had. The same can’t be said of any residual ranch Superkid destiny. “Kids today know a hell of a lot about Fortnite, but not very much about cattle cycles,” Heyneman says. Quinn spent the summer tourist season working in the nearby Bighorn Mountains as a cabin assistant, though his dad had been privately hoping Quinn would take up with a hardscrabble cowboy crew on the ranch. “That would have been a dream summer,” Heyneman says, the twinkle returning. But whose dream? EDITOR'S NOTE: This story appeared originally in The Carleton College Voice. Reprinted with permission. Also enjoy the short video below about the Padlock Ranch's 75th anniversary, featuring interviews with both Jim Scott and John Heyneman. 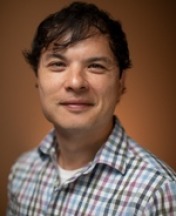 Before becoming associate director of public affairs at Claremont McKenna College in California, Thomas Rozwadowski served as senior editor and writer at Carleton College in Northfield, Minnesota. Prior to that he spent more than a decade as a newspaper reporter.